After Ranald proposed to me in New York, I immediately knew I had to incorporate the city we both loved so much into our wedding. As preparations progressed we realized that maybe we had to choose for another theme that was easier to accomplish since it was hard to find matching decorations with the theme. So we chose a travel theme for our wedding. Big surprise right ;)? This wasn’t easy though, we searched a lot online but we came up with some ideas of our own too. In this article we want to give you a sneak peek of our wedding day and give you some inspiration for your own (travel themed) wedding. A great way to let your theme known to your guests is through save the date cards and the invitation. On the save the date cards you can give your guest a hint of what the theme will be. We choose a simple card with a plane on it. Our invitation was a boarding ticket giving each guest ‘first class’ access to our wedding. The invitation even had a strip you could tear off and a boarding time matching with the appropriate gate (address). 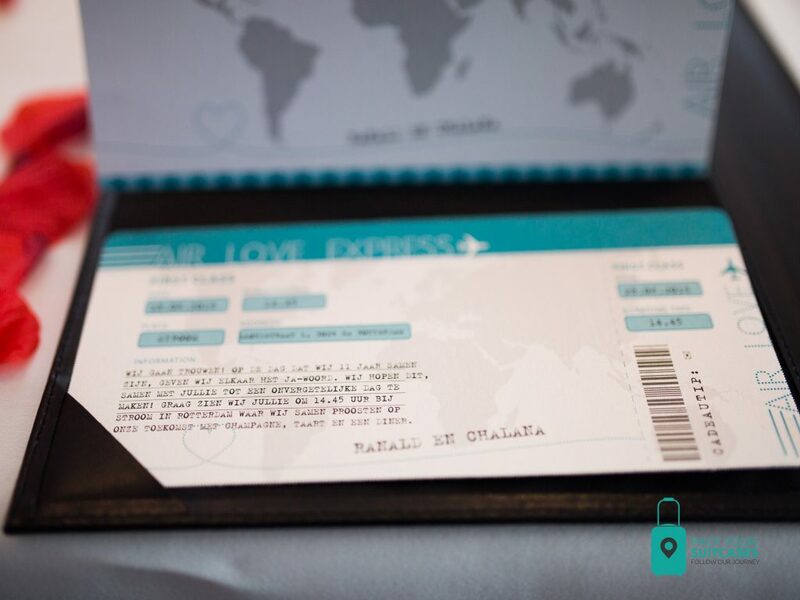 Travel themed wedding invitiation (plane ticket). Our guests love the invitation, they thought it was very original and hadn’t seen something like it before. Go crazy with decorations! It’s the perfect way to set the mood and the tone for your wedding. 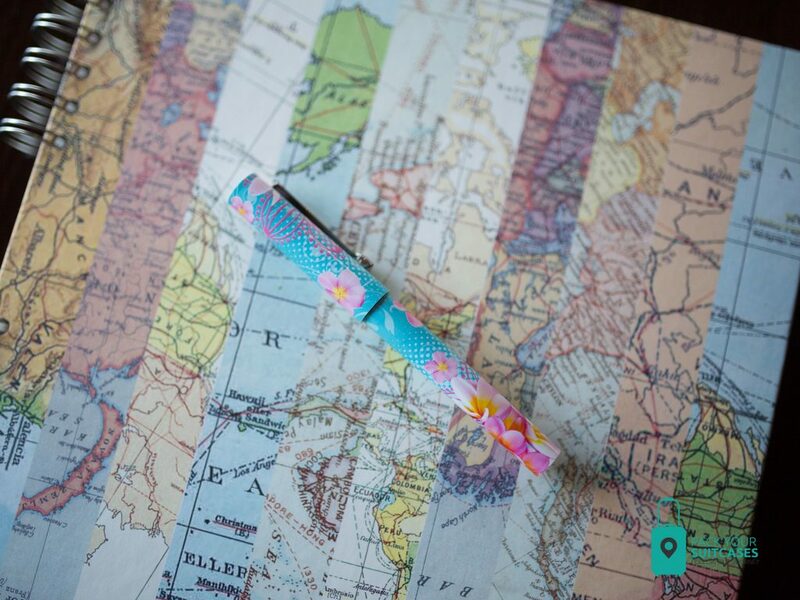 In our case there weren’t a lot of travel options when it comes to a theme like travel. A few plane shaped balloons and globe beach balls hanging from the ceiling did the trick! 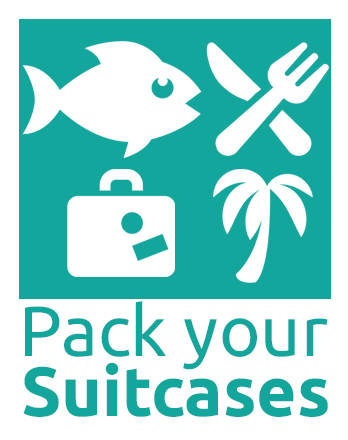 We also choose a lot of red and white decorations and made sure there were a lot travel inspired props like, signs, maps and even suitcases. Our guest book was even covered in a world map. The wedding cake is another thing that is great for setting the tone for your wedding. Any good wedding cake baker will be able to do a lot with fondant and icing. 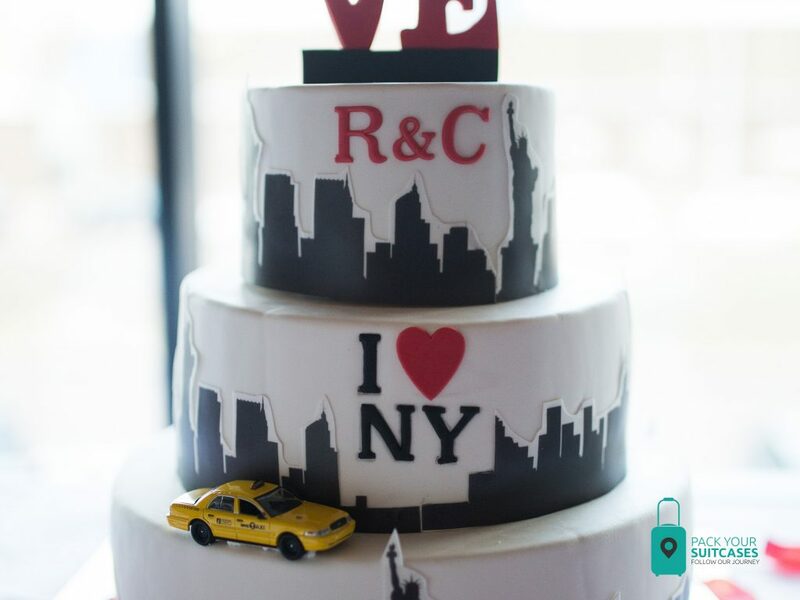 For our wedding cake we chose New York. We thought it would be nice to incorporate something connected to the proposal. Travel themed wedding cake New York. If you got engaged in Italy, why not choose for an Italian themed wedding cake? Or incorporate some globes or the honeymoon destination in the cake. The possibilities are endless, and again our guests thought our cake was very awesome! In the Netherlands a classic car is usually chosen to transport the bride and groom to the (different) venues during the day. We both didn’t like the idea of a classic car and wanted something different. We thought about a super car like a Lamborghini but that was very expensive and didn’t match our theme. By chance, we came across a company that rents real New York yellow cabs. The cabs have been imported from New York so we thought that this would fit our theme PERFECTLY! Travel themed wedding transportation (New York yellow cab). At first when we told people about the New York yellow cab, they thought it was weird. But when they saw it, they said it was a perfect reference to the New York proposal and they all wanted to take pictures with the car. During the day we had a few small things that set the tone. For instance, during our cocktail hour we had a beamer that showed the pictures of the proposal but also of all the places we visited in the world as a couple. In our ‘selfie’ corner we had put photo props that our guest could use and included a statue of liberty crown and a suitcase so people could get their pictures taken in style. The small parting gifts we gave our guest was according to the theme as well. It was a little bag filled with candy and luggage tag saying ‘New York’, ‘Paris’, ‘London’ or even ‘World Explorer’. Your theme doesn’t have to be represented in a big way, it’s the small things that count. Make sure the location of the photo shoot is according to the theme as well. For our travel themed wedding we had our photoshoot in front of Rotterdam’s iconic Erasmus Bridge and the Rotterdam Skyline. Our travel themed wedding photo shoot at Erasmusbrug, Rotterdam. We also went to a hotel called ‘hotel New York’ to link our wedding shoot to the location of the proposal and our favorite city in the world. And we took some amazing shots at our own local airport. One piece of advice: it’s your day! So if you like a certain theme, just go for it! We had a few mixed reactions when we told people about our theme but in the end everyone said that the wedding was something that matched us a couple completely. We even incorporated the wedding theme a little in our vows (“today I embark with you on the biggest journey of my life, our marriage”). And that’s what it’s all about, creating a day that is all about you and your significant other and the things you both love.